Phone Scoop goes in-depth with the Motorola Atrix 4G, a dual-core Android smartphone that can transform into a netbook replacement with the laptop dock accessory. 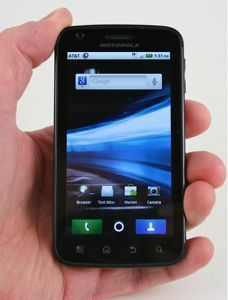 The Motorola Atrix 4G by itself is another me-too, slab-style Android smartphone. What makes the Atrix 4G unique isn't the phone itself, but the accessories that Motorola and AT&T have chosen to make for it: a laptop dock that converts the Atrix 4G into a netbook, and other docks for desktop and multimedia. Is this new-fangled vision the future of mobile computing, or just an expensive gimmick? What android device makes it 7 a.m. to 11 p.m.? Ever since the 1ghz phones launched last summer, the only way you get that battery life is with jumping through hoops (unsyncing, task killer, etc). More of a drawback to android unless you can show that somehow the Atrix is so much worse. The G2 easily gets a full day on a charge with moderate to heavy use, and with light use could almost make it 2 days. The phone comes with a Motorola Task Manager. By using the task manager, no battery issues at all. Great phone by the way, I left an Iphone 4 for it. Firefox can be tweaked to run better than chrome on slower/ older hardware and on slower connections through the about:config options. It may also have been easier to get Firefox running on ARM architecture since Mozilla is working on a mobile Firefox version, that is supposed to be based on the desktop Firefox code. I never really understand the premature reviews. I have used iPhone after iPhone, Samsung Captivate, and finally for about 5 days now the Motorola Atrix. Since I have been using the Atrix I have been VERY VERY IMPRESSED. I realize that even at 5 days of use I think every review is premature since we have no idea of longevity. I have been very saddened by Motorola lately. But oh my have they come back and came back hard they did. I will give my opinion on Signal, screen, battery life, speed, and accessories.